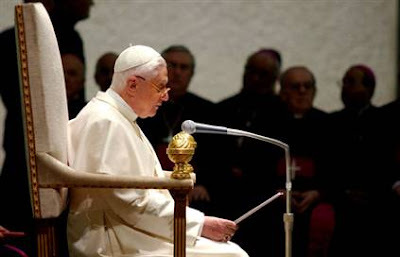 Whispers in the Loggia: "The Great 'Et Et'"
Twenty-eight months in, a staple of the current pontificate has been the "Q&A" sessions Benedict XVI has held with groups ranging from First Communicants to Rome's seminarians and clergy (and, so far, annually with the latter). As it brings echoes of his professorial days, it's no secret that Papa Ratzinger enjoys the sessions immensely -- so much so that he even holds them on vacation. In 2005, the newly-elected pontiff held the first of the sessions -- and a particularly memorable one at that -- with the clergy of the northern Italian dioceses where he stayed. In late July, the latest of the gatherings took place, this time with the local priests from this year's getaway destination of Cadore. It only took about a month, but the Holy See has finally let loose its English translation of the extensive, unscripted holding forth on topics ranging from the importance of thinking green, to the US' creationism-evolution debate, to the workload of priests, interreligious coexistence, divorced-and-remarried Catholics, and the legacy of Vatican II. I am Fr Lorenzo, a parish priest. Holy Father, the faithful expect only one thing from priests: that they be experts in encouraging the encounter of human beings with God. These are not my own words but something Your Holiness said in an Address to the clergy. My spiritual director at the seminary, in those trying sessions of spiritual direction, said to me: "Lorenzino, humanly we've made it, but...", and when he said "but", what he meant was that I preferred playing football to Eucharistic Adoration. And he meant that this did my vocation no good and that it was not right to dispute lessons of morals and law, because the teachers knew more about them that I did. And with that "but", who knows what else he meant. I now think of him in Heaven, and in any case I say some requiems for him. In spite of everything, I have been a priest for 34 years and I am happy about that, too. I have worked no miracles nor have I known any disasters or perhaps I did not recognize them. I feel that "humanly we've made it" is a great compliment. However, does not bringing man close to God and God to man pass above all through what we call humanity, which is indispensable even for us priests? Benedict XVI: Thank you. I would simply say "yes" to what you said at the end. Catholicism, somewhat simplistically, has always been considered the religion of the great "et et" ["both-and"]: not of great forms of exclusivism but of synthesis. The exact meaning of "Catholic" is "synthesis". I would therefore be against having to choose between either playing football or studying Sacred Scripture or Canon Law. Let us do both these things. It is great to do sports. I am not a great sportsman, yet I used to like going to the mountains when I was younger; now I only go on some very easy excursions, but I always find it very beautiful to walk here in this wonderful earth that the Lord has given to us. Therefore, we cannot always live in exalted meditation; perhaps a Saint on the last step of his earthly pilgrimage could reach this point, but we normally live with our feet on the ground and our eyes turned to Heaven. Both these things are given to us by the Lord and therefore loving human things, loving the beauties of this earth, is not only very human but also very Christian and truly Catholic. I would say - and it seems to me that I have already mentioned this earlier - that this aspect is also part of a good and truly Catholic pastoral care: living in the "et et"; living the humanity and humanism of the human being, all the gifts which the Lord has lavished upon us and which we have developed; and at the same time, not forgetting God, because ultimately, the great light comes from God and then it is only from him that comes the light which gives joy to all these aspects of the things that exist. Therefore, I would simply like to commit myself to the great Catholic synthesis, to this "et et"; to be truly human. And each person, in accordance with his or her own gifts and charism, should not only love the earth and the beautiful things the Lord has given us, but also be grateful because God's light shines on earth and bathes everything in splendour and beauty. In this regard, let us live catholicity joyfully. This would be my answer. As to sound-byte the Fluffiness is to do him an injustice, here's the complete translation.